… Schobertechnologies and their new machines and systems or our tools and modules. In our press releases you can find a lot of important information as well as press-photos or short clips, which are available to download. Do you need any more information? Don‘t hesitate to contact us. The development and production of the first Schober rotary die cutting and stacking machine for the production of in-mould labels goes back to 1990 and we can proudly announce that more than 60 RSM machines have been installed in over 30 countries all around the world. It is now recognized as the most advanced and efficient machine for the production of IML on the market. The rotary die cutting module has been fully redesigned to convert printing formats up to 1000 x 950 mm. Short setup times with minimum waste and cost-effective cutting technology with maximum lifetime, due to micrometric die wear compensation adjustment, are additional significant benefits of this converting technology. Embossing or micro perforation modules, as well as an injector holes waste ejection package, can be retrofitted at a later stage. In a fully modular design, the RSM1000-IML has integrated most of the proven stacking technology developed by Schobertechnologies over the years. The standard configuration of the RSM1000-IML includes an M-Stack delivery system. Available as an option or for future upgrades, is the S-Stack, as well as a high speed programmable robot automated stacking and counting system (Spider), which combines extreme acceleration, velocity and precision at a continuous web speed of up to 70 m/min. The equipment is designed to pile up different types of products combined within the same printing image. The product layout can be heavily nested or a combination of very large/long and small products. These changeable product specific pick-up plates accept products at synchronized speed and stack them non-stop into a dual piling cassette system. A 100% product inspection system with defective product discharge is available as well. Due to its specific design, the redesigned high performance RSM1000-IML is able to meet the specific demands of the market and new business challenges. Schobertechnologies GmbH is one of the leading specialists in the development, designing and manufacturing of rotary tooling, modules and complete specialty machines widely used in film, foil, packaging, nonwovens and paper converting industries. These technically sophisticated products are currently being used in over 100 countries worldwide. The term rotary punching technology includes, in addition to precision tools, extensive peripherals among all high capacity modules, designed for installation in an existing processing machine or supplied with its own drive motor and control system, an efficient punch waste extraction designed for maximum operating speed, and particularly necessary in high-speed units, a bearing block coolingsystem. The performance of these high precision units ranges for processing speeds of up to 1000 m/min and tool diameters of up to 600 mm, with working width of up to 2 meters. With productions speeds rising, and higher quality requirements from end users, Schobertechnologies Engineers have kept up with these demands, with further developments with their rotary punching tools and modules, all tooling is manufactured using the latest CNC technology. Also new materials and combination of materials for punches/dies, punch bars/die bars have been successfully tested. The latest design of modules also incorporates innovate approaches with regards to lubrication, heat build-up, thermal expansion, run out and unbalance. These developments have led to a clean and burr-free punching performance even on film as thin as15 μ. The products of Schobertechnologies have found their application in all sectors of Rotary processing. In addition to the traditional sectors of paper, film and foil processing industries, new applications fields could be acquired in the medical, automotive, security, electronical, and pharmaceutical industry. The Schobertechnologies high performance rotary punching modules are installed in most of the well-known rotary printing machines and converting lines, slitter-winders and extrusion equipment and designed to produce among all tea bags and tags, price tags, ATB- and ATB2-tickets, boarding passes, wallets, parking tickets, bank notes, security labels, smart cards, test strips, meat tray inserts, security documents, vegetable wrapping foils, band aids and components for solar panels just to name a few. The extensive portfolio of Schobertechnologies even includes special machines such as the RSR rotary punching machine with a working width starting from 50 mm for precise punching of films andother difficult materials. Schobertechnologies has specialized in the development, design and manufacturing of rotary die cutting machines, our RSM-IML is now recognized to be the most advanced and efficient machine for the production of IML on the market. The RSM-DIGI-VARICUT represents the latest generation of fully modular RSM machines designed to convert web width up to 850 mm and with repeat or format length of up to 1220 mm. Convince yourself by visiting our booth and have a look at the demo of the RSM410-MX-DIGI-VARICUT with robot automated stacking device. The SL106 is equipped with a high-speed belt stream feeder, a heavy duty die cutting station and a robot-automated stacking, counting & piling system. Most of the features which have proven their efficiency in the Schober web-fed die cutting machine such as the pre-set & calibrated cutting pressure adjustment, high-precision bearing assemblies with housings for low temperature running, vibration-free design & micrometric die wear compensation adjustment (GCS) have been integrated in the die cutting station of the SL106. In addition, the die cutting station is equipped with a vacuum controlled magnetic cylinder tool and a new/unique gripper sheet guiding system which ensures high-precision finishing of pre-printed sheets. The products are separated from the matrix immediately after the cutting process and redirected to the robot-automated stacking unit by a conveyor belt. Magnetic dies guarantee the shortest set-up time as well as the highest productivity even for short runs. The unique design of the die cutting station and its accessibility allows the possibility to integrate additional finishing tools at a later stage to generate creases (Folding Cartons), micro perforations (BML/TML) and injection holes (IML). The robot-automated stacking system is capable of handling different types of products combined within the same printing image. These can be heavily nested and a combination of large and small products. 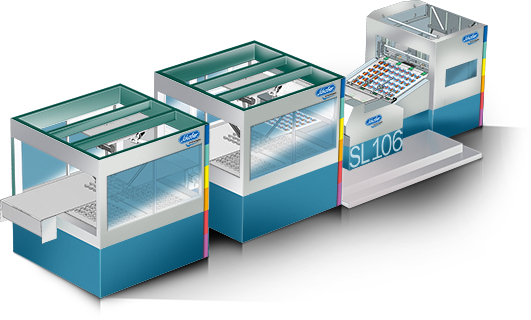 The SL106 is designed for a sheet size of 106 x 78 cm and a foil thickness starting at 50μm. High functionality and availability, flexibility and accuracy are the characteristics of this high performance production machine. The development and production of the first Schober web-fed rotary die cutting and stacking machines for the production of in-mould labels goes back to 1990 and Schober can proudly announce that more than 50 RSM-IML machines have been installed worldwide and are now recognized to be the most advanced and efficient machine for the production of IML on the market. With the RSM-DIGI-VARICUT, Schobertechnologies has developed a new Generation of hybrid drive technology especially designed for digitally printed flexible packaging materials which combines continuous and vector rotary die cutting technology in re-registration mode, thus a wide range of formats can be processed with a single tool. In fully modular design, the RSM-DIGI-VARICUT is designed to convert web width up to 850 mm, and with repeat or format length of up to 1220 mm. The standard configuration of the RSM-DIGI-VARICUT includes an M-Stack delivery system, available as option or for future upgrades are the S-Stack, an adjustable de-nesting station to handle several products across as well as a high speed programmable robot-automated stacking and counting system (Spider) which combines extreme acceleration, velocity and precision at continuous web speed of up to 50 m/min. The equipment is designed to pile up different types of products combined within the same printing image. These can be heavily nested or can be a combination of very large/long and small products. Product specific fast interchangeable pick-up plates take up products at synchronized high speed and stack them non-stop into a dual piling cassette system. A 100% product inspection system with defective product discharge is also available. The newly designed high performance RSM-DIGI-VARICUT is, due to its advanced design, able to meet the specific demands of the market and new business challenges. Short make-ready times with minimum waste and cost-effective cutting technology with maximum lifetime due to micrometric die wear compensation adjustment are additional significant benefits of this converting technology. Based on their widely recognised experience and expertise in designing and manufacturing of high-capacity die cutting modules, Schobertechnologies has introduced a cutting pressure regulator. This electronically controlled device allows for active pressure control which maximizes tool life and guarantees higher productivity. The development and production of the first Schober rotary die cutting and stacking machines for the production of inmould labels goes back to 1980 and we can proudly announce that more than 40 RSM-IML machines have been installed in over 30 countries all around the world and is now recognized as to be the most advanced and efficient machine for the production of IML on the market. In fully modular design the RSM-DIGI.VS has integrated most of the proven stacking technology developed by Schober over the years. The rotary die cutting module has been fully redesigned to cover the maximum image size, embossing and micro perforation modules can be retrofitted at a later stage. The standard configuration of the RSM-DIGI.VS includes an M-Stack delivery system, available as option or for future upgrades are the S-Stack, an adjustable de-nesting station to handle several products across as well as with a high speed programmable robot automated stacking and counting system (Spider) which combines extreme acceleration, velocity and precision at continuous web speed of up to 50 m/min. The equipment is designed to pile up different types of products combined within the same printing image, the product layout can be heavily nested or can be a combination of very large/long and small products. These exchangeable products specific pick-up plates takes up products at synchronized high speed and stack them non-stop into a dual piling cassette system. A 100% product inspection system with defective product discharge is available as well. The redesigned high performance RSM-DIGI.VS due to its advanced design is able to meet the specific demands of the market and new business challenges. Highest production quality and precise register accuracy during the converting operation, even at speeds up to 100 m/min are achieved through the integration of innovative servo-drive technology and continuously driven rotary die cutting tools. Short make-ready times with minimum waste and cost-effective cutting technology with max. lifetime due to micrometric die wear compensation adjustment are additional significant benefits of this converting technology. Know-How in machine development combined with high-capacity and vibration-free technology concepts guarantees high performance in noise-free environment. For more than 60 years Schobertechnologies has been leader in developing and producing rotary tools, modules and specialty machines widely used in film, foil, packaging, nonwovens and paper converting industries. This technically superior equipment is sold in more than 100 countries worldwide. 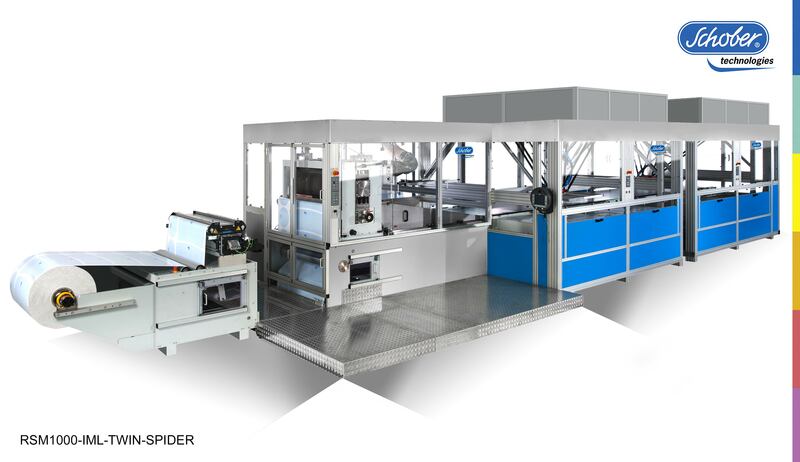 Schobertechnologies die cutting modules with working width up to 1000 mm and designed for production speeds of up to 350 m/min stand out, especially, for the modular line shaft driven machines as well as hybrid machine concept with individual drive technology. The innovative drive concept of the Schobertechnologies die cutting module offers higher precision and flexibility due to a precise electronically synchronous run and digital servo-drives. These high capacity die cutting modules feature among all a preset and calibrated pressure adjustment, high-precision bearing assemblies and housings for low temperature running, vibration-free design, micrometric die wear compensation adjustment (GCS) as well as central quick magnetic/anvil disengagement (without loss of registration) in order to ease web threading, save material during start-up and consequently shorten the set-up time. Know-How and superior production technology combined with the above mentioned high-tech features ensure that most materials available in roll format can be die cut at highest efficiency and productivity, even with liners (for self-adhesive materials) as thin as 23 micron (0,023 mm). Experience and expertise provide Schobertechnologies with the ability to meet challenging customer demands. By steadily enhancing and improving the converting technology, Schobertechnologies is able to meet ever changing market requirements such as run length, different product shapes, sizes and material. Schobertechnologies GmbH introduces Multilayer product processor – MLPP – for the converting of OCA material for touch panels and lens. Schobertechnologies GmbH is a subsidiary of Schober GmbH Holding. Schobertechnologies specializes in the development, design and manufacturing of rotary tools, modules and specialty machines widely used in film, foil, packaging, non-wovens and paper converting industries. This technically superior equipment is sold in more than 100 countries worldwide. MLPP is the perfect machine for the production of high precision self-adhesive elements used in the automotive, telecommunication and electronic industry. The machine consists of 9 processing stations for cutting, punching, laminating, delaminating and Cut & Place operations, these proven technology is used for the safe transfer and placement of pre- die cut parts or products at fixed or variable spacing, in register on a continuous running web. The intelligent single drive technology combined with digital servo-drives provides extremely close registration and low web tension which makes this machine ideally suited for difficult to process and sensitive materials. For more than 20 years Schobertechnologies has been leader in developing and producing rotary die cutting machines and converting systems for the IML manufacturing industry. Experience and expertise provide Schobertechnologies with the ability to meet challenging customer demands. By steadily enhancing an improving converting technology, Schobertechnologies is able to meet ever changing market requirements such as production runs, various product shapes, sizes and materials. The die cut product handling options on the popular and well-established RSM line of rotary die cutting machines has now been extended with the Spider, a high-speed programmable robot automated stacking and counting system, which combines extreme acceleration, velocity and precision in stacking very long IML products at continuous web speed of up to 50 m/min. The equipment is prepared to handle different types of products with exchangeable product specific pick-up plates taking up products with synchronized speed and stacking them non-stop into a dual piling cassette system. A 100% product inspection system with discharge facility of the bad products is available as well. Other proven product stacking/delivery devices include M-Stack – for very short runs, S-Stack – high performance for long runs, SM-Stack – for very awkward products and SMA-Stack – fully automated solution. For more than 20 years Schobertechnologies has been an industry leader in developing and producing rotary die cutting machines and converting systems for the IML manufacturing industry. Experience and expertise provide Schobertechnologies with the ability to meet challenging customer demands. By steadily enhancing and improving the converting technology, Schobertechnologies is able to meet ever changing market requirements such as run lengths, different product shapes, sizes and materials. Today Schobertechnologies does not only supply the converting solution, but also the know-how and other services which are necessary to lead to a successfully operation. The standard configuration of this modular designed machine includes an “M”-stack delivery system. S-stack or V-stack (robotics) delivery systems are available as options or for future upgrades. The machine is available for working widths of 410 mm, 520 mm, 550 mm, 740 mm and 850 mm. The M-stack delivery is used for short runs, the S-stack for long runs, the SM-Stack for very challenging/complex products. The SMA-Stack for fully automated stacking, counting, piling and bundling, and the V-stack for very large/long products which can not be handled with the M- or S-stack delivery system. The perfect and economical solution for medium and small production runs. The machine is available in working widths of 260 mm, 330 mm and 410 mm. The MX model features nearly all the proven technologies integrated in the high capacity models such as heavy duty rotary die cutting station, automated web guide, continuously monitored registration, vacuum controlled product flow, static neutralizer and M-stack delivery. Over the last 60 years Schobertechnologies has continuously expanded its product lines. This company philosophy has been successful and is being rewarded by the market. There are only a few companies today that can provide such comprehensive consulting services to their customers. Schobertechnologies has gained a substantial level of know-how over decades. This enables Schobertechnologies to provide its customers with individual components to retrofit existing production lines and complete systems as turn-key solutions to create value added products. Thanks to the consistent integration of new production processes into the Schobertechnologies product portfolio, new markets have been developed, i.e. electronic, medical and pharmaceutical industry. – Rotary converting machine (PBO) as inline and offline version, developed for the production of hinge lid blanks, display cartons and rounded corner blanks for cigarette packaging as well as blanks for liquid packaging, beverage carriers and general folding cartons. – Rotary cutting and creasing tools for processing packaging blanks, in segmented design, for extended life time by the use of special materials / alloys for the die cutting section combined with a wear resistant anvil in Top Coat design. The rotary cutting tools can be supplied in 2 versions, RP or RC. – High-Performance punching modules used to create opening features in liquid packaging, e.g. straw holes or spouts. 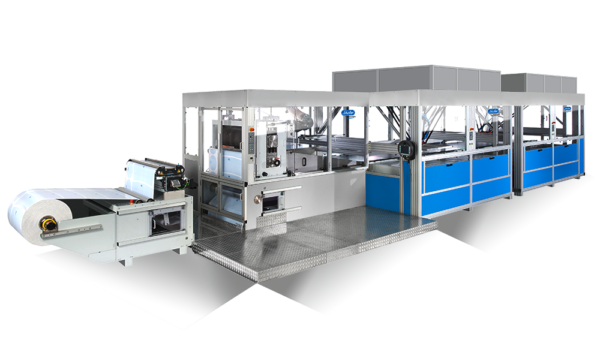 – Built-in modules to install on foil sealing machines for the die cutting of inspection windows in liquid packaging blanks or into general folding cartons. – Modules and tools for braille embossing. The braille embossing can either be applied in printing or converting machines. In the printing machine the braille embossing can be applied in the creasing or die cutting station. This cost effective technology can also be integrated into existing cylinders as an upgrade. The embossing tool consists of a negative and positive embossing segment. The negative embossing segment carries an universal design. The male embossing segment consists of a carrier segment and an exchangeable embossing blade or a carrier segment with interchangeable embossing pins. The information transmitted through this font is product and language specific.